Haynesworth to New England: Reach or Belichick Coup?? The NFL lockout comes to an end and all hell has broken loose. A condensed free agent signing period has led to some interesting moves yet some have left us scratching our heads. Today’s head scratching incident comes courtesy of Bill Belichick and the New England Patriots and the acquisition of Albert Haynesworth. 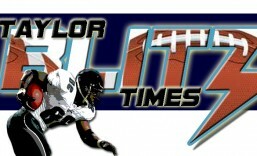 This disgruntled DT has left the Tennesee Titans and Washington Redskins in his wake with his “play when I want” mantra. Maybe Coach Belichick feels he can resuscitate Haynesworth’s competitive spirit like he once performed with Randy Moss and Corey Dillon. However there are a few notable differences. At one point Dillon and Moss had played at competitive levels that were legendary. Randy Moss set the rookie record with 17 touchdowns with a 1,300 yard campaign and was the impetus for the highest scoring team in NFL History (at that time) in the Minnesota Viking’s 556 point 1998 campaign. Corey Dillon while in the midst of playing for a perennial loser sat in complete embarrassment in 2000 when Inside the NFL was there to interview Cincinnati Bengals players about “Had the Bengals become the JV of the NFL.” He answered questions with a fire that burned from his eyes and the next week he took it out on the Denver Broncos rushing for an NFL record 278 yards on just 22 carries destroying Walter Payton’s previous record of 275. Destroy? Yes destroy. When Walter Payton set the record 22 years before he had rushed 40 times. When Dillon broke the record in 2000 he had 6 runs for -6 yards and on the other 16 carries?? He ran 16 times for 284 yards….yet I digress Dillon and Moss had other notable games that were amongst the best in NFL history. Albert Haynesworth?? He has had several flashes where he dominated games yet never seemed to put it together over a complete season. He has been dogged with onfield and off field incidents like the stepping on Cowboys center Andre Gurode in a pile up that got him suspended in Tennessee or when in the midst of a $100 million dollar contract, he defacto deactivated himself because he didn’t want to play in Washington Coach Mike Shanahan’s 3-4 defense. For a player who seemed to dog it when it was time for him to shine, you’d think $41 million reasons to excel, in guaraneed money last year, would spring from the competitive juices and kick-start a star whose play can be second to none when fully channeled. 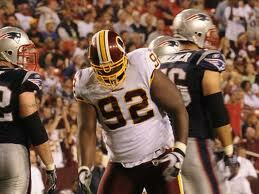 So what does Belichick see in Haynesworth?? What makes him think he can turn it around?? Well we had been critical of Bill Belichick’s moves during the draft period and if this works, he Vince Wilfork (The _) can give them the equivalent interior pass rush in the AFC as what may be the Detroit Lions in the NFC with Ndamokung Suh and Nick Fairley. Its hard to believe it can work because the times when Randy Moss and Corey Dillon were brought in, he had veteran laden teams headed by Tedy Bruschi, Tom Brady, and Rodney Harrison. However the feeling that Haynesworth may revert back to his selfish ways and put himself ahead of the team seems to be the uphill battle that most fans and pundits will have to be convinced of. We’ll have to stay tuned to see if this reclamation project of Bill Belichick’s is a success. What do you think will happen?? This entry was posted in Uncategorized and tagged Albert Haynesworth, bill belichick, new england patriots, nfl football, washington redskins. Bookmark the permalink. The devil is in the details. If they retain the whole load of his contract thenj it is a bad move. But if Snyder eats some of his contract and NE gets him on the cheap then it could work. Like Moss they can cut strings in mid stride and not sweat it. But if he is owed a bunch then Haynesworthless will be difficult to part with. He has had ample opportunity to show that he is not as bad as everyone makes him out to be, but has declined to do so. Which leads me to believe he’s a big fat lazy slug. Not a good move in this man’s opinion. I agree with you on both counts. The salary hit is a bad thing but this guy has just botched every opportunity to show he has his head on straight. If he plays this year and isn’t a nuisance, I still will believe that it would be an aberration with him and not the norm.